Rental agreements are documents signed between a tenant and a landlord agreeing upon certain terms and conditions acceptable to both parties. Getting involved in a rental transaction without an agreement is dangerous and leaves room for legal disputes. We cannot stress enough on the importance of a rental agreement which is why we offer the facility to create one in the quickest way possible. How To Create A Quick Rental Agreement? The conventional way to draft a rental agreement would begin with the tenant and the landlord discussing and arriving at clauses they both require. This would be followed by both parties approaching a lawyer to draft an agreement for them and then printing it on stamp paper. However, this process would take weeks in some cases. With the onset of technology and the widespread use of the Internet, even the process of legal drafting has been made electronic. Several rental agreement templates are available online. That said, such agreements may not be drafted by experts in the field of law and may not cover all possible contingencies. This is why we recommend the use of only a lawyer verified and comprehensive rental agreement. What Should Be Included In A Quick Rental Agreement? Rental agreements are contracts that are in place to avoid potential legal spats and also as a cautionary step against people going back on their words. It is always recommended that you make the strictest ever rental agreement but you can be relaxed at times, especially if parties involved know each well. Quick rental agreements can be said to be the most basic kind. It covers only the most essential clauses and is kept concise although legally comprehensive. Full name, address and contact details of landlord and tenant. Monthly rent, security deposit and maintenance charges (if any). Full address and details of the premises being considered for tenancy. Specific clauses requested by both parties. Nature of resolving disputes, if any arise. Incidents that could lead to termination of the agreement. This is only an outline of what a quick rental agreement is. If you need something more strict, we recommend that you go with the elaborate rental agreement which is just as easy to prepare. Quick rental agreements are not very different from regular rental agreements except that such contracts are kept more concise. However, the requirements to make it legally valid are exactly the same as that of a regular rental agreement. 1. What is the difference between regular rental agreements and quick rental agreements? They are not very different actually. A regular rental agreement is rather elaborate and would include pages and pages of clauses alone. A quick rental agreement is typically kept short. It only has the most basic clauses and details and is typically used by people who need a rental agreement ready in at the earliest or when you need to use it as an address proof document. 2. Is a quick rental agreement equally strong legally? Of course, it is. As long as you have followed every step mentioned under requirements to make a rental agreement legally valid, a quick rental agreement is just as enforceable as a regular rental agreement. The difference between the two is some additional clauses which are rarely used by the common public. 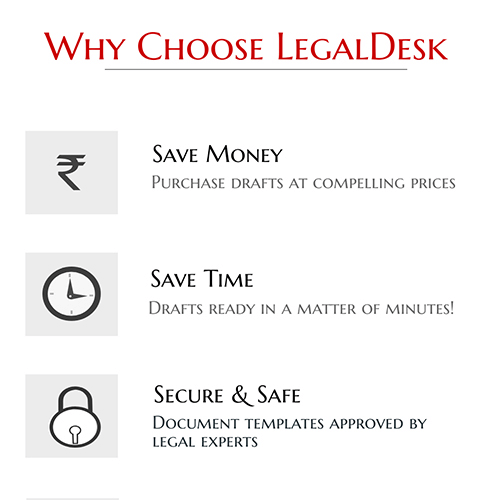 LegalDesk offers an array of lawyer verified, pre-drafted legal documents. Our quick rental agreement is a very popular document that people all of the country make use of. You can simply fill in your details, review it and print a soft copy yourself. We also have the option to print it on stamp paper of state mandated value and delivering to an address of your choice! Go ahead, try it now.